NASA image courtesy Ken Duda, U.S. Geological Survey (USGS) Earth Resources Observation and Science (EROS) Center. Caption by Holli Riebeek. Instrument: Terra - ASTER. [SatNews] When Super Typhoon Haiyan struck the Philippines on November 8, 2013, it pounded the island of Leyte with winds near 315 kilometers (195 miles) per hour and a tremendous storm surge. In Tacloban, winds blew a wall of water ashore that may have been as much as 7.5 meters (24.6 feet) high. Much of the city sits less than 5 meters (16 feet) above sea level. These false-color images hint at the impact of the storm surge and winds on the city. 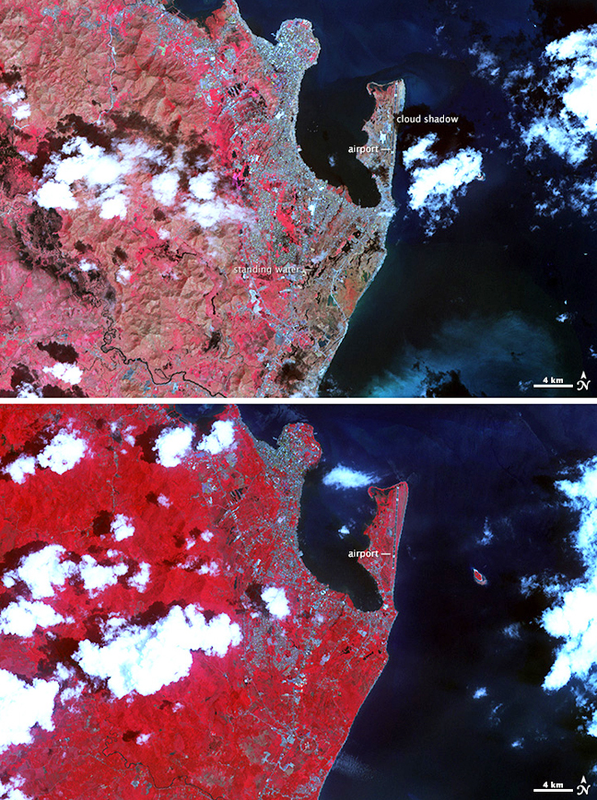 The Advanced Spaceborne Thermal Emission and Reflection Radiometer (ASTER) on NASA’s Terra satellite acquired these images on November 15, 2013 (top) and April 3, 2004 (lower)—the last mostly cloud-free ASTER view of the city. Plant-covered land is red; urban areas are white and silver; bare ground is tan; and water and shadows are black. From ASTER’s wide perspective, it is not possible to see individual city blocks of destroyed buildings. But the subtle differences between the images do reveal a wide-scale disaster; those changes are easiest to see if you turn on the image comparison tool. The most obvious difference is a change in vegetation. In 2004, the mountains west of the city were covered in dense vegetation; in 2013, the hills are bare. Nine years elapsed between the two images, and many things could explain the change. People may have cleared the land, or the plants may simply look different in November than they do in April. Since this is a tropical location where seasons have little impact, it is just as likely that Haiyan’s winds are responsible for the change. News photos of the hills show trees stripped of leaves or blown down. Near the coast, the storm’s impact is more unequivocal. Much of the area south of Tacloban is tan where the storm surge washed away plants and buildings, leaving mud-covered ground. This is the clearest evidence of the storm surge. The small peninsula where Tacloban’s airport is located was one of the most severely affected parts of the city, and a close look at the image shows that this area is also brown, which means that few plants or buildings survived. Interestingly, the large geometric white shape near the airport is new compared to another satellite-based map from July 2013. The shape indicates that this is a man-made structure, perhap associated with relief efforts at the airport. Changes to the city itself are subtle. At first glance, it appears that Tacloban grew between 2004 and 2013. The city appears more densely built, and it expanded along the outer edges. However, some of this growth may be an illusion. More recent views from other satellites, including the Google Maps view show a neatly ordered city with green space separating city blocks, much like the 2004 image. In 2013, that plant-covered land is gone, replaced by silver. The ordered grid of streets, visible in 2004, is blurred in 2013, perhaps covered by a field of debris. A radar-based satellite analysis by scientists at the Jet Propulsion Laboratory confirms widespread destruction in downtown Tacloban. The final signs of storm damage are the pockets of water on the landscape. In this type of false-color image, water is black or dark blue. Traces of floods are visible south of Tacloban and west of the hills on the left edge of the image. Some of the dark spots are shadows cast by clouds. This pair of images demonstrates both the challenge and the value in mapping disasters with satellite data. The images give a view of the entire city and its surroundings, a view that would otherwise be very difficult to obtain. On the other hand, some of the change is ambiguous and requires ground-based information to understand.